Some of our colleagues from Mytrip2nepal recently travelled to the place called “Chitlan” from where the first car was brought down to Kathmandu back in 40’s. There they met a legendary person named DHAN BAHADUR GOLE, 91 years old, nick name “Jungge Buda” one and only known surviving car porter among 64 other car carrier. 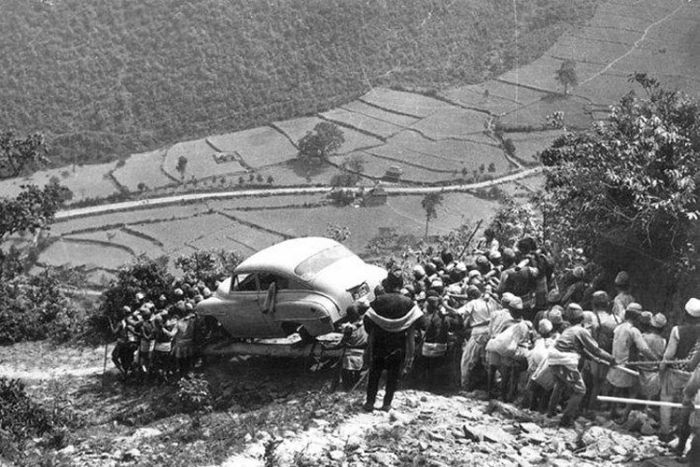 In the year 1940’s and 1950’s before Tribhuvan Highway was made and linked kathamandu to Indian Border, car porters used to carry car. There was only two ways to get down to capital city Kathmandu either by foot or by air. At that time Shahs and Ranas were the only one who used to bring cars to Nepal from Calcutta by ship and these cars were drove upto Bhimphedi, and then porters used to carry from Bhimphedi all the way down to city via Chitlan Gaun. Dhan Bahadur Gole was 17 years old when he first served as porter among 64 others. People from different places of villages such as Bhimphedi, Markoo, Kulekhani, Chitlan and many more served as car porters at that time. As a labor allowances they used to get 1 rupee day. “Motor bokera din ko 1 rupeeya pauthiyo k garnu pugdaina thiyo, tesaile aama le gheeu liyara bazaar gai bech bhannu hunthiyo, tyo bela manako aak rupeeya parthiyo”, says Dhan Bahadur Gole. Translated as below : He says carrying car was not enough and he has to sell dairy product which his mother used to give him and at the time was cost of pure butter was 1 rupee per bucket. While our conversation was taking its pace, “He Says , I didn’t even know or recognized the model of a car ,we used to name them with 32, 64, 96 as of number of porters carried motor”, reflected by Dhan Bahadur Gole (Jungge Buda). Dhan Bahadur Gole says, he carried about 30 cars over twenty year’s period of time. All three porters including a leader form his village Chitlan is dead. In his life he had married three girls of which he have two sons and he lives with his granddaughter and his family in Chitlan. This entry was posted in Travel on 11/03/2015 by mytrip2nepal.